Last year I was asked to write a column about my favourite memories of 2017. I decided the format should be a “Top 17 Moments of 2017.” It was pretty easy, there were a thousand stories that popped into my mind and I found the hardest thing to do was get to the list whittled down to less than a dozen and a half. With that said, the thought of writing in the first person makes me cringe. The word “I” doesn’t appear in my columns, as the stories about the people on this team from players, to coaches, to front office staff are far more important than anything this scribbler has to offer about himself. Sadly, there was no Grey Cup this year. Nobody predicted the team would miss the playoffs, but for me the season was different for a completely different reason than where the team appeared in the final standings. I went from being a member of the media who had an arm’s length relationship with the team to becoming a part of it. It gave me a perspective on things that I honestly didn’t expect. I’d soon find out he was bang on. Many of the best ideas come over a beverage. My gig with the Argos came as the result of one…okay, two. In March I contacted Dave Haggith, the Senior Director of Communications at MLSE. With the sale of the team still fresh, I wanted to pick his brain and find out what he was thinking about in terms of radio and website coverage for the upcoming season. I hadn’t seen Dave in a while. He had been the Argos Media Relations Director for a couple of seasons during a period when I was not the play-by-play voice. He suggested we meet casually instead of formally, so we connected at a watering hole near the Scotiabank Arena. The conversation was relaxed and I was glad to see he still had a warm spot for the team he had worked for back in the day. Without getting into details, we discussed ideas on how to gain a stronger footing in the Toronto market. He was invested in the discussion and was happy to see that I hadn’t lost my enthusiasm for the Argos. 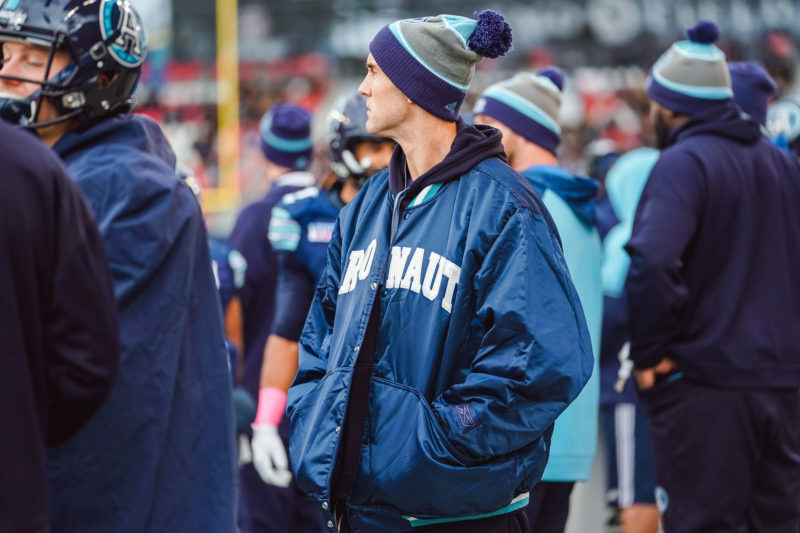 To make a very long story as short as possible, when a position opened in late June I received a call from Dave to meet with him and Chris Shewfelt, the Argos Vice President of Business Operations. They offered me a job in the communications department. It would combine radio, website contributions and working with the team on a daily basis, primarily fulfilling media requests for interviews and doing things like writing game notes. The kid had officially gained entrance to the candy store. Dave, Chris, G.M. Jim Popp, and President Bill Manning were all on board and I can’t thank them enough for having the confidence in me to join the organization. The season was busy, but I loved every minute of it – aside from some of the final scores. I’m looking forward to an incredibly busy off-season to try and make Argonauts football more enjoyable to follow on several different levels. From the time I was a kid I knew I wanted to work in radio. That fact was reiterated at a reunion a while back when someone I went from kindergarten to high school with reminded me that in grade two I wanted to work in that industry. That dream played out from March 1983 to late June 2018 when I signed on with the Argos. To be honest, I didn’t regret leaving radio, or more accurately, having radio leave me. The one true aspect of my job at TSN that got me the most fired up was doing Argo play-by-play, which I am thrilled to be able to continue doing in my new role. I have the best of both worlds. With that said, on my first day, I was experiencing an odd mixture of over-the-top enthusiasm and absolute fear. It was the first non-radio job I’d held since selling shoes at the Foot Locker at the end of high school. I wasn’t sure if I was capable of anything other than talking into a microphone, and I wouldn’t be going to work in the comfort of a referee’s jersey. All of a sudden I was using mass transit again, heading from Whitby to downtown Toronto. The GO Train got me to the Ex grounds in time to be in the office by 9:00. Hang on, the office? This was something that was going to take some time to get used to. The first day I walked in there was a giant Manila envelope at my desk with my name on it and a pass card inside. The transition was continuing. Hang on, a desk? People in radio usually get a mail slot, if they’re lucky. In 35 years in radio, I’d only had a desk of my own once, for two years in Ottawa when there was actually a Rough Riders to cover. I feared it may take some time to get used to this concept. It took about one minute. I share a cubical with Communications Manager Chris Balenovich. Luckily we get along (read: he’s not sick of me yet), so that’s good. We’re in the football operations office at Coca-Cola Coliseum, meaning we’re surrounded by people who are all on the same page, which to me is unusual. This may sound like a shot at my former industry, but it’s not intended to be. In radio, everyone at the station is trying to generate the best possible ratings they can. They’re happy when their station’s overall ratings go up, but in all honesty, the most important thing is the ratings report for their own show. That shouldn’t be surprising, as one’s job security relies on how good a show’s ratings are. So although it’s within a team structure, there really is a “me not we” mentality. The most striking thing about this office, football operations and beyond, is that everyone truly wants the same two things; to win the Grey Cup and see the stadium filled with fans. Do you know what that feels like? To go to work every day when everyone wants to accomplish the same two goals? To this office newbie, it’s made every single day a joy to go to work – if you can call it that. The Argos first game of the pre-season was at Tim Horton’s Field in Hamilton. I knew that one portion of my article would focus on the kicking battle between Swayze Waters and Ronnie Pfeffer. I assumed one or two positional players would jump off the field at me and I’d write about them as well. It took exactly one play to figure out who to write about. The Ticats used their starters against essentially the Argos rookies and backups. On the first play, Jeremiah Masoli threw a six-yard pass to Brandon Banks, who was tackled without gaining another inch. I admit I love a good, old-fashioned form tackle from a defensive back. A quick check of the roster showed the tackler was Trumaine Washington, a true rookie from the University of Louisville. On the next play, Masoli looked downfield, trying to hit Jalen Saunders over the middle. Guess who was there to knock the ball away again? When I got home I watched the game on PVR, writing down all the kicking results, and tracking the plays of the former Cardinal. He was outstanding. His worst play resulted in him picking off a pass. As the play started, Washington got flipped around. He turned outside, had to recover and turn back to the middle and was still there in time to pick off the pass and return it 50 yards. In what was already a deep secondary, the Miami native had made a major step forward in his attempt to make the team. He eventually got an opportunity to play and was eventually recognized as the Argos Most Outstanding Rookie. I can’t tell you how much I love stories like this. When a young, unheralded player makes the team, then makes a significant contribution, it reinforces the idea of why you love sports so much. Some phone calls are better than others. When the phone rang in April I was thrilled to see that it was from Jeff Johnson, my partner on the radio broadcasts. J.J. is someone that’s always fun to talk to. He’s a positive guy who does everything in his life with a great deal of passion, especially when it comes to family. That was the reason for this call, and I didn’t like the sounds of it. Jeff explained that his family had decided to move to Halifax, home base for the company he had been working for. It was a chance for Jeff, Kelly, and their kids to share a new adventure, and with the number of air miles he was logging, to spend more time together as a family. I couldn’t have been happier for them, I couldn’t have been sadder for me. It would mean losing a fantastic broadcaster and even more importantly, a guy I have a great deal of affinity for. Chris Schultz was a mainstay on CFL broadcasts on TSN. An Argonaut for nine seasons after a three-year run with the Dallas Cowboys, Chris and I first got to know one another in 1993. The left offensive tackle blew out his knee in the season opener in Edmonton, and someone suggested he join me on the air at “The Fan 590”. 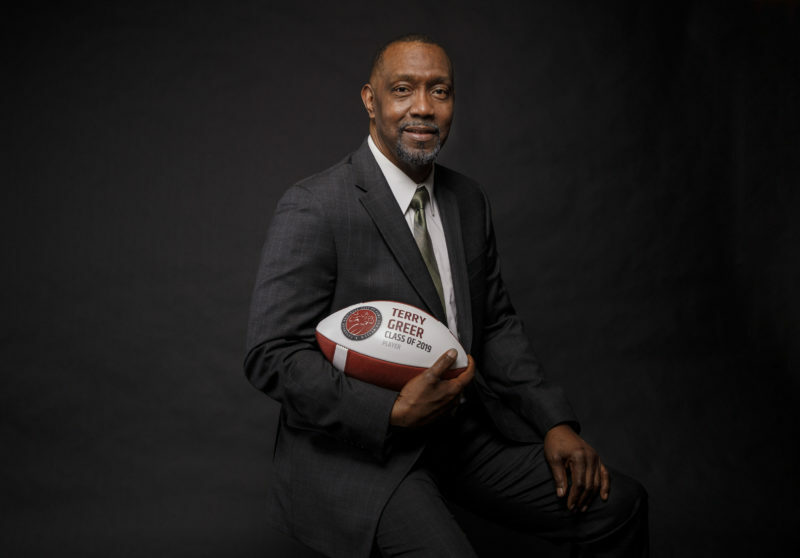 He made regular appearances with me, and after returning to the field for one more season before finishing his career in 1994, we co-hosted a show called “Football Sunday” which dealt with the CFL, NFL, the then-CIS and NCAA. If it was an interesting football story we dealt with it, no matter the league. It turned out there was. Chris became my fifth broadcast partner with the Argos, following Pete Martin, Adrion Smith, Sandy Annunziata, and JJ. I knew it may take some time, especially since it took several days for things to be finalized. It was evident early on that Schultzie was the right man for the job. Upon his hiring, I started getting texts, usually at around 7:00 in the morning. Then more during the day, then others just after supper. He had questions – about the personnel, the coaches, the broadcast, our chemistry, where to park, things like that. Chris is one of the most prepared broadcasters I’ve ever worked with. He has depth charts sent to him, but also does a hand-written version because it makes him more comfortable with personnel. He has copious notes, but rarely uses them because writing them out helps him memorize what he needs to know. Our first broadcast was not simple. An easy broadcast is a 45-44 game with eight lead changes and several huge plays. The first game we called was the home opener, a 41-7 loss to Calgary, a game that saw the season-ending injury to Ricky Ray where he was on the ground for what seemed like four hours. Those are the toughest games to call and Schultzie was fantastic. If he could pull that off the rest would be smooth sailing. The coolest thing about Chris this year was his unbridled sense of fun. I received an early morning call before our first broadcast and on the other end was a super-enthusiastic 6’7” former offensive tackle. He said that as many games as he had analysed for TSN, this one was different. He didn’t have to be neutral any longer, the big man could openly root for a team that he starred with for almost a decade. To him, it felt like a game day to him for the first time since he retired after the ‘94 season. When I heard that, it confirmed what I had sensed all along, that he was the only real choice for the job. The big man was fantastic. I hate everything about having to write this part of the column. This is where I was supposed to write about the triumphant return of the leading passer in Argo history. 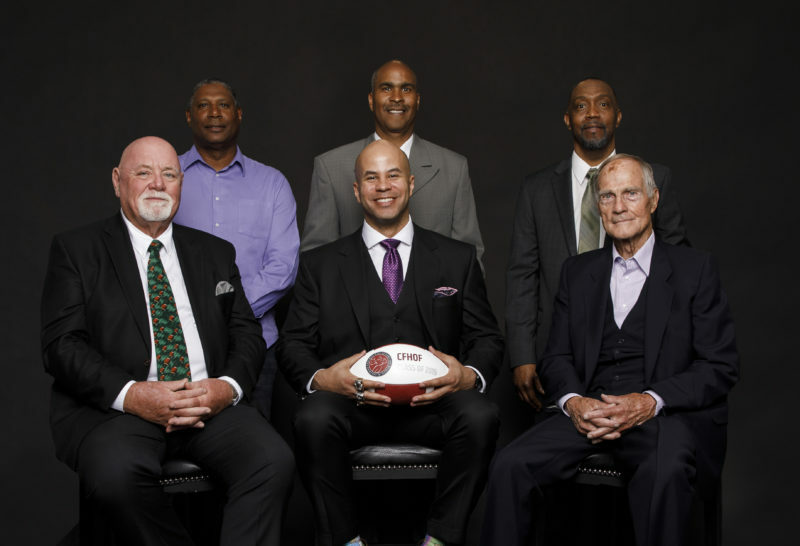 The story would parallel that of John Elway, the legendary NFL quarterback, who was told to retire after winning his elusive first Super Bowl at the age of 37. Elway returned and silenced his critics by winning a second-consecutive championship and then retiring. Elway 2.0 did not happen. We all know the story, Ray was injured in the home opener. Broadcasting a game through an injury is never an easy thing, especially when it appears to be serious. You don’t want to raise alarm bells, but have to convey that the injury is more than just an ankle sprain. It becomes even tougher when a) the treatment of the injury goes on for an abnormally extended period, b) the person who suffered the injury is someone you’ve known for several years and like a great deal, and c) your broadcast partner is calling his first game. Welcome to the broadcast booth Chris Schultz, your first assignment is calling a 47-7 loss with a half-hour delay while the star quarterback is taken to the hospital on a stretcher. FYI Schultz handled it like the pro that he is. I didn’t see the QB for a while after the injury. He was doing some early rehab away from BMO Field. The first time I ran into him was a few days after he sustained the injury. I walked into the locker room while practice was just wrapping up at Lamport Stadium and was startled to see Ray, donning a neck brace, riding the stationary bike to stay in shape. It’s rare for a broadcaster to be at a loss for words, but I was taken aback by what I had just happened upon. He was reassuring, saying he was doing okay, but it was still sad to see one of the greatest quarterbacks the CFL has ever seen relegated to riding the bike while wearing the brace. He’s a player I loved watching while he playing for Edmonton and was beyond excited when I first heard of his trade to Toronto. Calling his games in Double Blue has always been fun, and getting the opportunity to call his first Grey Cup win remains a personal highlight. I hope he plays another five years, though I’m not naïve enough to think that will happen. I just hope he makes the right decision for himself, his wife Allyson and their two daughters. As much as I respect him as a player, I respect him as a person even more. He was perhaps the most intriguing of any potential CFL free agent. James Franklin apprenticed behind Edmonton quarterback Mike Reilly for three seasons and was eligible to test the market in February if he didn’t re-sign with the Eskies. 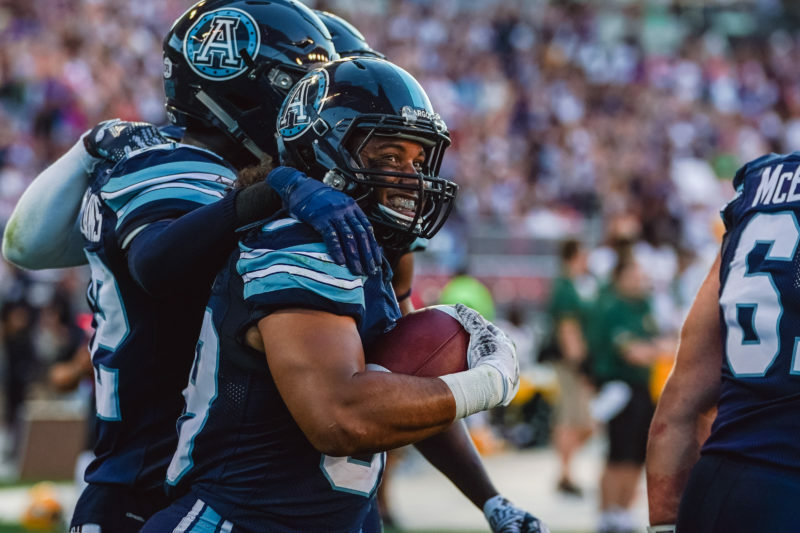 In an eye-opening move just two weeks after winning the Grey Cup, the Argos acquired the rights to Franklin, along with a third-round draft pick in exchange for young offensive lineman Mason Woods. G.M. Jim Popp was gambling that he could sign the QB before the free-agency period began. That roll of the dice paid off when Franklin put pen to paper in early January. Ricky Ray was still QB1. There would be a battle for the backup job, a competition that was exceptionally close between Franklin and returning pivot McLeod Bethel-Thompson. When Ray was injured it was the University of Missouri product that received the first chance to take over. He’d start against Edmonton, and win. Then came a loss in Northern Alberta before back-to-back losses to Winnipeg. Franklin didn’t play well, certainly by his own standard. In the two games against the Bombers, he threw for a combined 387 yards with no touchdowns and four interceptions. Marc Trestman made the change, handing the keys to the car to Bethel-Thompson. Franklin didn’t take it particularly well. By nature, he’s easy going with a smile that seems permanently etched on his face. But the smile was gone, he was disappointed in the way things had transpired, something he admitted during his appearance on the Double Blue Podcast. After through his brief ‘woe is me’ stage, Franklin accepted his role and became a threat in short-yardage situations. He particularly thrived near the goal line and finished the season with 14 rushing touchdowns, which broke the Argos single-season rushing touchdown record, previously held by Robert Drummond and Gil Fenerty. It also tied Doug Flutie’s CFL record for most rushing TDs by a QB in one year. Franklin got an opportunity to start the final four games of the season and at times looked sensational, particularly in the final quarter of the game in Vancouver, where he came on in relief. With a new offence in place in 2019, one of the more intriguing stories in camp will be seeing how the returning QBs work in the new system. It was an interesting test for Franklin in his first Argo start, a home game against his former team. With 10 minutes left in the fourth quarter, Sean Whyte kicked a 41-yard field goal to give Edmonton a 17-12 lead before “Frank the Tank” went to work. Using a heavy dose of James Wilder Jr., Franklin engineered a 12-play, 75-yard drive that ate over seven minutes off the clock. He’d complete three-of-four passes on the drive, culminating in a five-yard TD strike to Declan Cross, followed by a pass to Armanti Edwards for a two-point conversion. It was efficient. 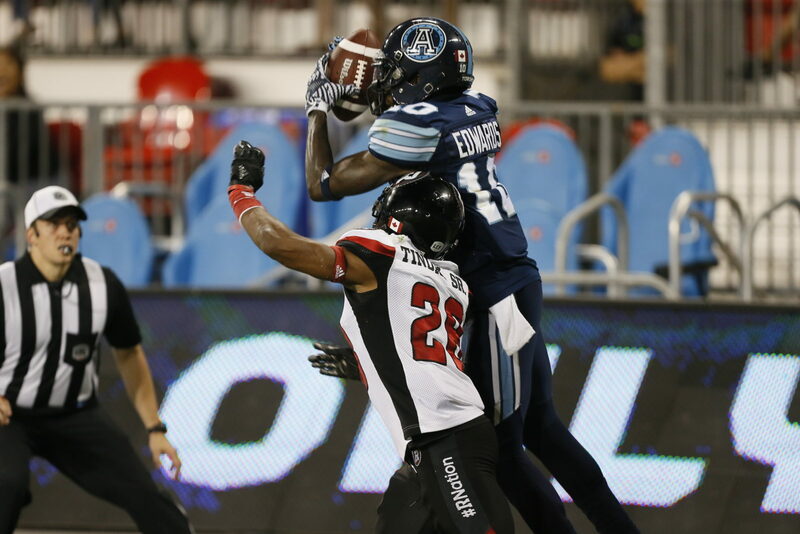 It involved five ball carriers or receivers, and it gave the Argos the lead. The defence forced a two-and-out and Toronto got the ball back with just over two minutes on the clock. Franklin and company kept the yardsticks moving and ended up maintaining possession and getting the victory. It’s what was expected of Franklin when the trade was made, and when it mattered most on that sunny Saturday afternoon, the QB lived up to the substantial hype. We didn’t know a lot about him, even though he had been here for a season. What was known about McLeod Bethel-Thompson was that he had been a human ping-pong ball, bouncing from team to team to team over close to a decade. It was a heart-warming story. A guy who dedicated himself completely to live out his dream of being a starting pro quarterback. With that in mind, if you didn’t like what happened on August 2nd then you should check to see if you still have a soul. The San Francisco native spent time with eight different teams in four different leagues between his NCAA days – naturally split between two universities – and landing in Toronto. Leading up to the game the QB told me that he had zero hesitation about preparation or nerves. He knew the playbook inside and out and if he had any anxiety at all it was about whether there’d be any rust due to his lack of playing time. The first half against the Redblacks didn’t go exactly as planned. 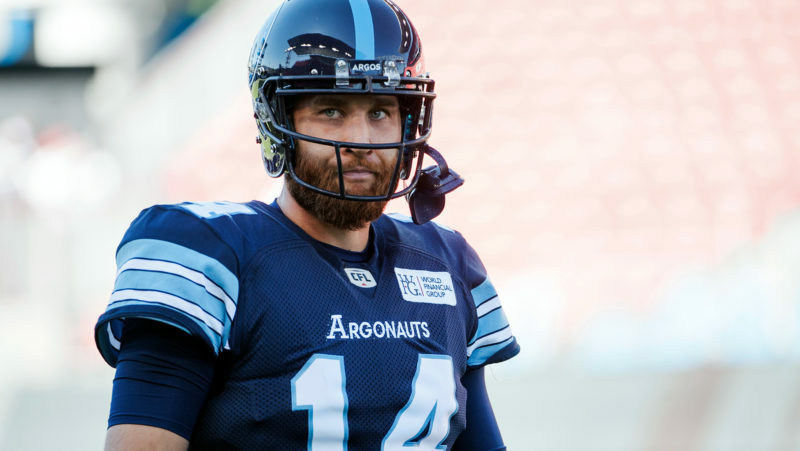 The Argos trailed 28-7 at the break and the quarterback’s numbers weren’t earth-shattering. Then something magical happened to the Sacramento State product in the second half. He came out of the locker room and something clicked. He was precise, he was showing the things that had gained the trust of Coach Trestman. He’d finish the game with over 300 yards passing with four TD strikes and would win his second start as well, but before leaving his debut, there’s one specific play that needs to be revisited. In terms of on-field highlights, it would be hard to argue that the zenith didn’t occur at the end of Bethel-Thompson’s first start. The first two-and-a-half quarters were far from memorable and the Boatmen found themselves trailing 38-14 with the lowlight being an 83-yard punt return by former Argo Dionte Spencer. 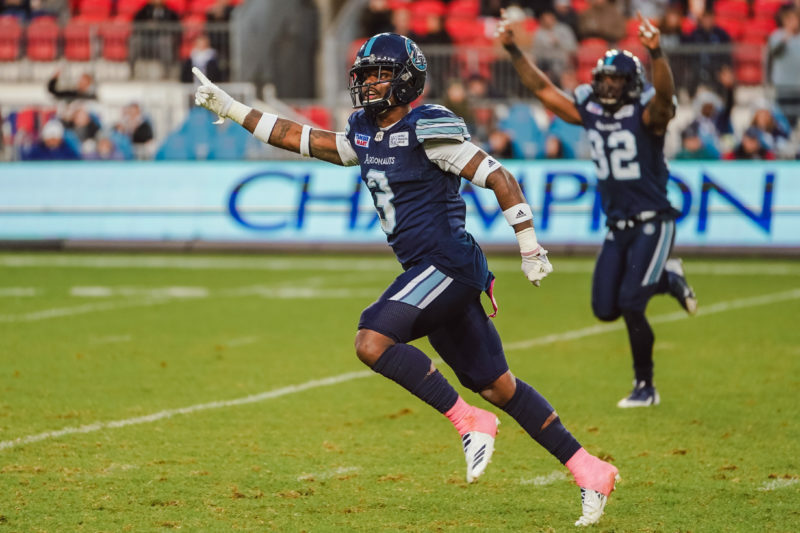 There was no indication the Argos were about to mount the second-biggest comeback in franchise history, but that’s exactly what happened. James Franklin scored on a QB sneak and it was 38-20 after three quarters. Bethel-Thompson hit S.J. Green for a TD, and after the teams traded field goals, he’d connect with James Wilder Jr. for another major. After the defence forced a Redblacks punt, MB-T jogged out to the huddle, trailing 41-36 with less than two minutes remaining on the clock. All he needed was a 76-yard touchdown drive to complete an incredible story. The newbie starter looked like someone with 100 or so starts under his belt. 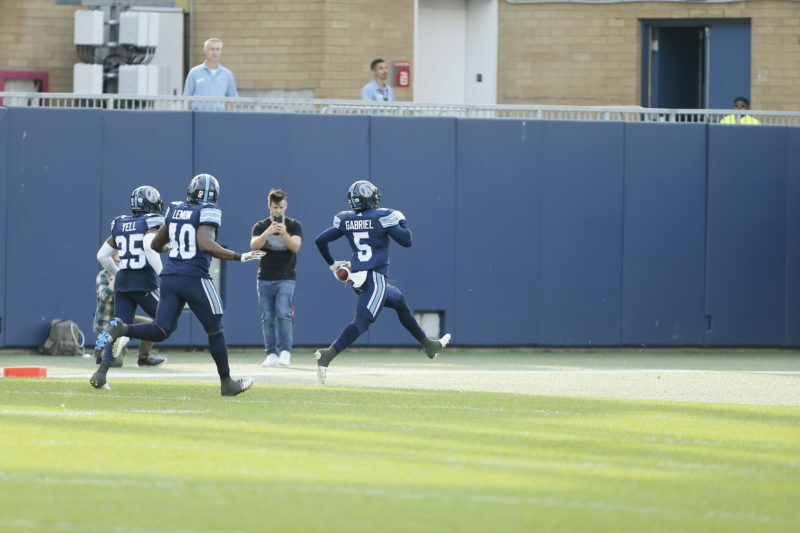 After four completions and three running plays, the Argos were at the Ottawa 23-yard line with just nine seconds on the clock. Armanti Edwards, the most underappreciated of all the Argos, started as the number two receiver in the slot to the left side. He ran a wheel route and found himself in single coverage with no help over the top. Bethel-Thompson saw this and never seemed to take his eyes off Edwards. He stepped up in the pocket and let it go. The pass was perfect. Edwards had Cory Tindal draped all over him, but still made the catch. A quick glance at the scoreboard showed the Argos had taken a 42-41 lead with just one second left. BMO Field erupted. No doubt there were people who left early with a once lop-sided score who couldn’t believe their ears if they were listening to the game. I didn’t know what to expect. I had never interviewed the man, had not even talked to any of his former teammates in an off-the-record manner. I knew Duron Carter the same way the overwhelming majority of fans did, as a great player with a reputation as being a disruption. When he arrived I had a good chat with Carter in the locker room before he made his first appearance before the cameras. He was exceedingly polite, he wanted to do what was best for the organization, and he was funny. As the days and weeks progressed I saw Carter interact with his teammates on a daily basis, on the practice field, and in the locker room. Any preconceived notion I may have had of him being an instigator was quickly dispelled. He got along with his teammates exceptionally well. He was not the light bulb looking for the moths to come to him, he was just one of the guys. Coach Trestman often talked of Carter’s attentiveness in meetings and how he asked the right questions, not just saying things to bring attention to himself. When Carter caught a TD pass from James Franklin at the end of the game in B.C. I thought I was witnessing a glimpse of the Argos future. A pending free agent, we will see where Carter ends up playing this year. I do know my opinion of the man changed a great deal over the last few months. I remember the first time I saw Llevi Noel play football. The Argos had played an afternoon Labour Day game in Hamilton, which meant that on my way home I could stop at Varsity Stadium and see the University of Toronto host Laurier in the 2014 OUA season opener. It was a gorgeous night and I ran into many people I knew and some I hadn’t seen in some time. I went from my Argo family to my OUA family, to my literal family, with my three stepsons all having ties to the teams playing that evening. As the game began, it didn’t take too long to notice Laurier running back Dillon Campbell – a player who would eventually be drafted by the Argos. He was virtually unstoppable that night and finished with a total of 293 rushing yards. Meanwhile, a player with the Varsity Blues was having a spectacular night of his own. Noel stood out for more than just his talent. He was physically mature for that level, especially as a receiver. He was a combination of height, strength, and speed that on that night was virtually unstoppable. He finished with nine catches for 190 yards, totally forgotten because of the game Campbell had. Fast forward to the Argos war room for the 2016 CFL draft. I was writing a behind-the-scenes article for TSN.ca and before the draft started I asked then general manager Jim Barker what he thought of the Toronto native and he said he really liked him. When I checked out the Argos draft board I saw he was ranked 15th overall. They were thrilled to select him 31st overall. Noel was a rookie who was more than a bit nervous when he first took the field. He grew, catching a TD pass in his first season in very limited snaps. This year, his third in the league, he was given an opportunity when Anthony Coombs was injured and he certainly took advantage. The Western Tech product finished with career highs with 47 catches for 512 yards and even scored a touchdown on special teams, returning a fumble 49 yards against Winnipeg. He’s under contract for this season and has proven he doesn’t look out of place having played several of the receiver positions. Watching him develop from an OUA star to a CFL player with more to give was certainly a highlight this season. When he arrived at Argos camp for the first time in 2013 he was someone I had on my radar. I had talked to General Manager Jim Barker after the draft and he was over-the-moon excited about a kid he had picked in the second round, who had most recently played junior football for Calgary after a brief stint at the U Sports level. There were many vocal discussions in the locker room his season, many of them revolved around the NBA. On the day of the Raptors gigantic trade with San Antonio, the Argos returned to BMO Field after practice. As the players changed to get ready to have some lunch, Gabriel was surrounded by several teammates, mostly from the defensive side of the ball, each of them saying the Spurs had ripped the Raptors off. Gabriel sat in front of his locker and deftly defended Masai Ujiri’s move despite being shouted down and towered over by as many as ten players. So far the kid from Scarborough’s NBA analysis is looking pretty good. Gabriel is still not the most vocal player in the room, but he’s grown into a leadership role. He was playing the best football of his career before an injury ended his season after just 11 games. This is a perfect example of why sports can become so emotional. I love watching all levels of football, three or four down. While I still watch a ton of CFL, U Sports and NFL ball, I rarely watch NCAA football anymore, I just don’t have the time. When I watch a Bowl game, or just some random Saturday evening tilt, I don’t have the same level of interest and the reason is quite simple, I don’t know the players. If you’ve read this far into the article there’s a high probability you’re a big Argos fan. You know more than just who the QB is. You know most of, if not all the starters. You know the backgrounds of many, if not most of the players. That makes a huge difference. For me, watching Gabriel’s development as a player and maturity as a man has been rewarding. Learning the background helps create a connection between the player and the person in the stands. To me, that’s why sharing those stories on Argonauts.ca is so important in growing the popularity of this team. Not much was known about Alden Darby Jr. when he showed up in Toronto in 2017. In fact, so little was known that we called him ALL-den, not AL-den. He made a strong first impression at BMO Field when he stepped in front of a Darien Durant pass and returned it for a 45-yard TD against Montreal. Sadly, he suffered an injury and missed the remainder of the season, forced to watch the Grey Cup final from the sideline. The native of Long Beach, California came to camp in 2018 with something to prove. There was depth in the secondary and a starting job wasn’t guaranteed. Darby once again stood out and easily earned a starting job. 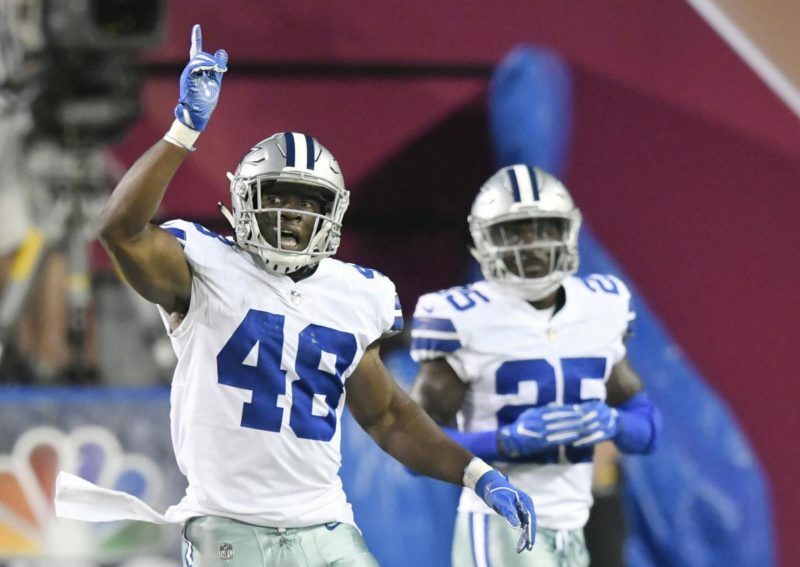 His versatility proved to be invaluable, eventually seeing him line up at the ‘Sam’ linebacker spot. What was memorable about seeing Darby daily was observing his natural ability to assume a leadership role. He’s a sponge for knowledge, and like Cassius Vaughn, he assumed a vocal leadership role on the field, making sure everyone was on the same page. Off the field, Darby showcased his personality a lot more. One of the more interesting days was when the show “The Next Step” taped a post-practice session with Darby, Justin Tuggle, and Shawn Lemon. It’s a dance show that airs on the Family Channel and the three Argos were joined by members of the cast for an on-field segment. Not only did Darby show off his moves when the cast members led the way, at one point the defensive back, unscripted, took the lead and started teaching the pros. That was pure Darby. Having fun while not afraid to lead. Combined with his playing skill, his value to the team, especially in an off year, was immeasurable. A complaint from Argo fans over the years has been that not all bars will put CFL games on their TVs. For one specific road game this year that was far from being a problem. 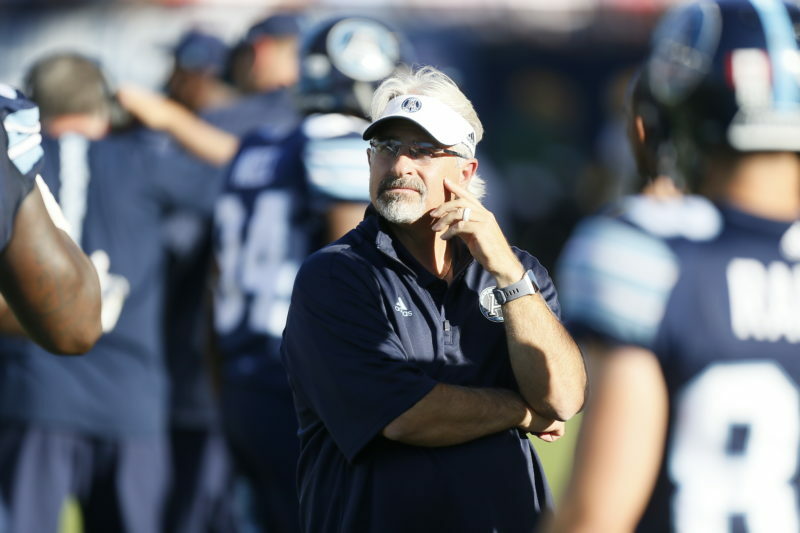 In August the Argos rolled into Montreal, coming off a couple of wins over Ottawa and B.C. and looking to start a stretch against Eastern teams. Someone in the office thought that a viewing party at Real Sports would be a great idea, but there was one problem – it was early in the week and the game was on a Friday night. In rapid order, the bar was booked and the invitations went out. I was asked to emcee the event, to which I enthusiastically said yes. I had one fear though, how many people would show up on extremely short notice? The correct answer would be a lot. Fans were greeted by cheerleaders and a tunnel of Double Blue balloons. The lower bar was at capacity when I arrived, the upper level would follow suit quickly. Damon Allen was there, Bob Bronk was there (as an aside, the former Argo fullback has now been on my year-end list both years and I will never hear the end of it), Leo Ezerins, the former linebacker for the Bombers and Ticats and currently the Executive Director of the CFL Alumni Association was there, former Blue Bomber, Roughrider and Rough Rider receiver Michael Collymore, whom I had not seen in ages, was also there. Mostly though, it was the fans that made the evening. The room was packed and it was loud. We had fun playing Argo trivia at halftime and it was a fantastic night of football fellowship, even if the scoreboard didn’t cooperate. I’m hoping there are more of these parties in the future, just with a different final score. S.J. Green is different. I don’t mean that in a bad way at all, in fact, quite the opposite. On the field, he’s an exceptional talent, off the field he’s just one of the guys, though his leadership intangibles are through the roof. What makes S.J. Green different is that he’s providing leadership from a position that isn’t often targeted as one that provides that quality. I mean, receivers are supposed to be divas, right? Not Green, he’s anything but a “me first” guy. Mookie Mitchell, Arland Bruce, Jeremaine Copeland, Chad Owens, Andre Durie, Mo Mann, Dontrelle Inman, and others have all been stellar receivers in my time calling games, but none provided the same level of intangible that Green brings, with Copeland perhaps being the closest. When Green practices, the other receivers pay attention to what he’s doing. When the veteran speaks, they listen, as do any other players that happen to be in the area. He doesn’t make a scene, he doesn’t bring attention to himself, he just works his rear end off and leads by example. Nobody was 100 percent sure that Green would be any good after major knee surgery and his subsequent trade to Toronto, not even the man himself. He took a hit over the middle on his first catch as an Argo and it was at that point that the receiver finally knew he’d be okay. Green had another 1,000-yard season without the benefit of stability at quarterback. He’ll be back in ’19 which should make Argo fans, and whoever the starting QB is, salivate. There’s also no doubt that invaluable leadership intangible will be present as well. If you’re an Argos fan in the GTA you know it can be tough at times trying to find a good conversation about your boys in blue. The organization is working hard to spread the glory, but you’ve probably experienced a time or three when you’ve wanted to talk about the Boatmen, but couldn’t find an audience. Imagine then what it’s like to also be an OUA fan in the GTA. The calibre of football is fantastic and it’s a great feeder league for the CFL, just look at the 2018 Toronto roster and you’ll see that 18 Argos played in that specific conference, with several more playing for other U Sports schools across the country. It would be difficult to count how many conversations this year were held in the Argo locker room about OUA football. Jake Reinhart played at Guelph, while his brother Job had a standout season there this year, which led to at least one conversation per week about the Gryphons. I’ll admit to using the OUA as an ice-breaker. The first time I chatted with Zack Medeiros we were in the lunch room, and I used his Western roots to open the conversation. It’s helped me develop a commonality with players, who perhaps feel a little more at ease with me when they find out I’m a legitimate fan of the Canadian game. At the office, sitting amid the scouting staff, there was plentiful conversation about players and teams, which culminated with a handful of us standing around a computer screen on a Saturday afternoon, watching the final minutes of a playoff game between Guelph and Ottawa. It’s another reason I enjoy the job as much as I do. I find myself truly immersed in a culture of Canadian football. These guys don’t just talk a good game, they live it. Marcus Ball is a pro’s pro. We know what he’s capable on the field, while his leadership skills are undeniable. While some players are quiet leaders – and the Argos had several of those last season – Marcus is the opposite. His pre-game speeches are legendary, and he’s always been someone who backs up his words with outstanding play. Ball had one of the more, shall we say, memorable plays of the season, but what could have been disastrous ended in about the most positive way possible. The Argos hosted the B.C. Lions on August 18th. Leading by a point, Travis Lulay dropped back and threw to the right side. 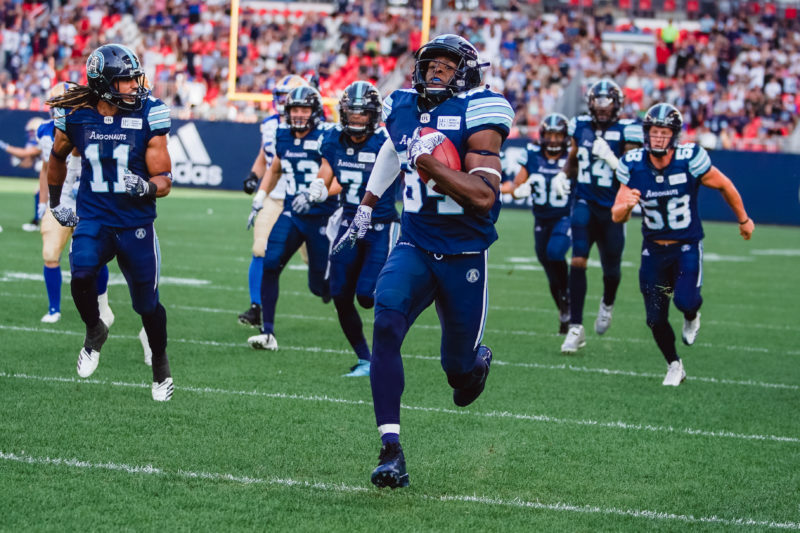 Reading the play perfectly was the Argos ‘Will’ linebacker, who jumped in front of the receiver, intercepted the pass, and was sprinting for a game-clinching touchdown, but a funny thing happened on the way to the end zone. With nary a Lion in sight, Ball dropped the football. He wasn’t hot dogging, he wasn’t showboating, he wasn’t hit, Ball simply dropped his namesake. B.C.’s Chris Rainey recovered it and the Lions were again looking to move into position to kick a game-winning field goal, but after catching a pass, Manny Arceneaux was hit by Jermaine Gabriel and the pigskin came out. Marcus Roberson had a shot at it, but it inevitably it was recovered by, who else, Marcus Ball. He took the ball and punted it into the stands behind the Argo bench, no doubt experiencing an emotional gumbo of elation, frustration, and relief. The Boatmen hung on for the one-point win, highlighted by the most unusual sequence of the season. 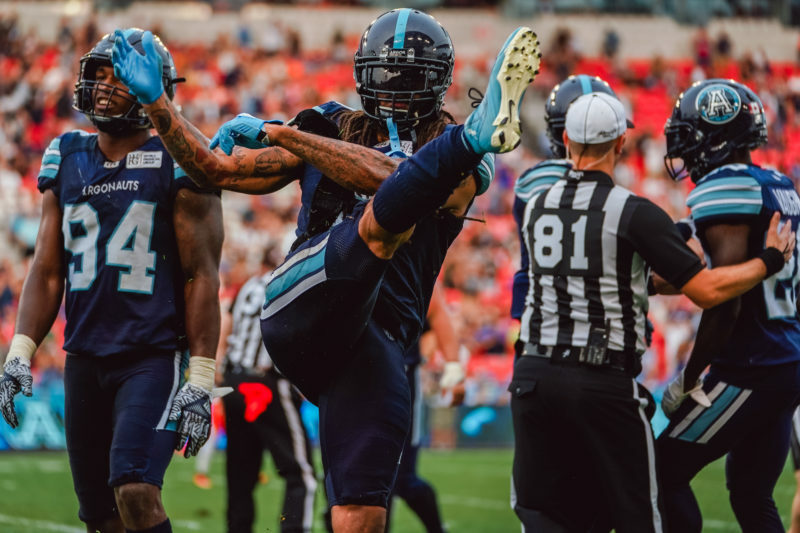 This year’s column was done more in chronological order than anything else, but there’s no doubt for me what the number one story of 2018 was, and that’s been getting to better know people connected to the Argos. Perhaps my favourite part of the job is being called into the boss’ office. Hearing the drawl of Jim Popp beckon “Come into the office for a visit” almost always starts with something work related, but often veers in unexpected directions. His football experience is vast and I enjoy playing the role of a sponge and soaking up as much as I can. Marc Trestman and his coaching staff were fantastic to work with, as was everyone in football ops, ticketing, and the support staff, all of whom I have the pleasure of seeing daily. If you’re still reading this column, which by the way was not supposed to be nearly this long, thank you for indulging me. If you haven’t picked up on this by now, I have a great deal of affinity for this organization and the people who work within it. The season was difficult from a win/loss perspective, but for me, it was filled with highlights, just from a different perspective. I know how talented these people are and how hard they work. That gives me a great deal of optimism about the 2019 season. I hope you’re along for the ride.